How effcient is your brain? A high-end CPU these days uses nearly 100W of power. But it doesnâ€™t have nearly the computing power of a human brain. AI is in good part, perhaps mainly, a software problem, but raw computing power seems lacking too. So how many of todayâ€™s CPUs would it take to build a computer with human intelligence? Say at least 10,000 Opterons. This 10K CPU computer system would use 1MW of power. So how does that compare to a human brain? A person runs on 2000 Kcal / day. At 86400 s / day this is 23 cal / s x 4.187 calories / J = 97 J / s. J / s are equal to Watts so this is 97 W.
Say 40% of the bodyâ€™s energy is used by the brain. Then a personâ€™s brain uses 40 W, as much a weak light bulb. Which is order-of-magnitude correctâ€“your head is a little cooler than a weak bulb but the bulb is smaller. So a human intelligent computer would use 1MW of power while a personâ€™s brain uses 40W. The human brain is 25,000X more effcient than a computer. This says a few things about todayâ€™s computers. They are terribly inefficient, at least for the types of computations an AI needs to do. And todayâ€™s AI software design doesnâ€™t capture the organization of biological computers. We have 1000 CPU systems today, and could build 10K CPU systems. But no system today is as clever as a mouse. Todayâ€™s AI may have crested the house fly brain goal post. But the lack is clearest in the hardware architecture. Some students have been complaining about the price of textbooks for certain classes. Curious, I went to the bookstore and roamed the stacks, seeing just what theyâ€™re paying. The students are right. The costs are absurd. Intro to [a popular foreign language] â€” $200. He starts out getting it, then rambles on about how not much can be done by the College. Come on now, why would an introductory language class *need* a new textbook? Language instruction changes very slowly. Why not pick the best from the last decadeâ€™s editions and use only used textbooks? And your complaints about a system where the college buys the books seem poorly thought out. The *point* of such a system is to put the college in the crunch zone. And the college is better able to handle itâ€“pressure publishers, reuse books, or pick inexpensive titles. 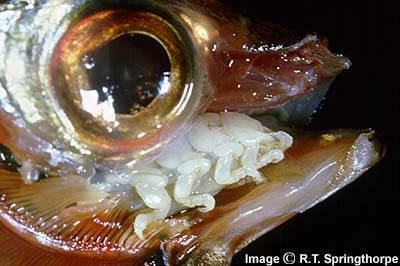 Hereâ€™s a picture from a story making the rounds because it turned up in a London fishmarket. 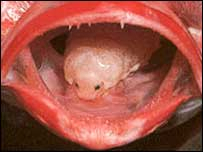 Itâ€™s Cymothoa exigua, a fish parasite. 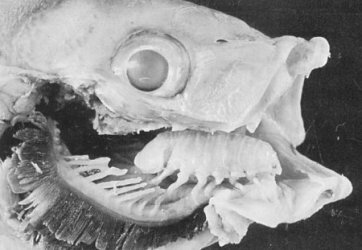 The 3.5cm creature had grabbed onto the fishâ€™s tongue and slowly ate away at it until only a stub was left. 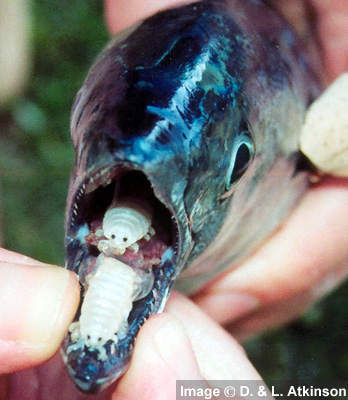 It then latched onto the stub and became the fishâ€™s â€œreplacement tongueâ€. 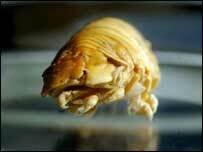 The bugs are usually found off the coast of California, so itâ€™s possible the fish was imported to the UK. Be glad you have hands to pull it off you if it bites your tongue. The poor fish is stuckâ€“his fins canâ€™t reach in and grab it! I installed Expression Profiler Next Generation (EPNG) on my site. My interest is in canabalizing parts of it to show gene expression clusters. Turns out that part uses SVG which is a poor choiceâ€“SVG requires a browser plugin, a separate install, and isnâ€™t even available for Mozilla/Firefox (the Adobe plugin for Netscape 4.x seems to work on the Mac, but not on the PC). So itâ€™s a large and sprawling. I found it hard to install. Admittedly, I made it harder than expected by porting it to Mysql, but it was a pain even apart from that. Among the install joys are the release not workingâ€“the database schema doesnâ€™t match the code! Boy that was a fun set of bugs to find. And one of the modules required, XML::LibXML::SVG doesnâ€™t exist! Google doesnâ€™t know about it! It looks to be a private or temporary module, perhaps it got converted to SVGâ€“most of the API and function is shared by the two. I converting the code to use SVG, but it was a huge bother!